Some years ago, BBC television introduced “Play of the Month” some of which involved filming sequences using an outside broadcast crew. One such play was “Infidelities” which included outside broadcasts from the Furnace Pond in Slaugham, and Wykehurst Park on the Bolney/Warninglid border. For just one day, on 11th July 1983, Slaugham became a filmset. My father, Roger Ray, organised matters on behalf of the Slaugham Parish Council and the BBC confirmed details in writing naming the fee payable by the BBC for allowing the filming to take place, and confirming the extent of the BBC’s Public Liability Insurance Coverage. These two amounts were £20,000,000 and £75 and you can probably guess which amount relates to the fee and which to the insurance cover! 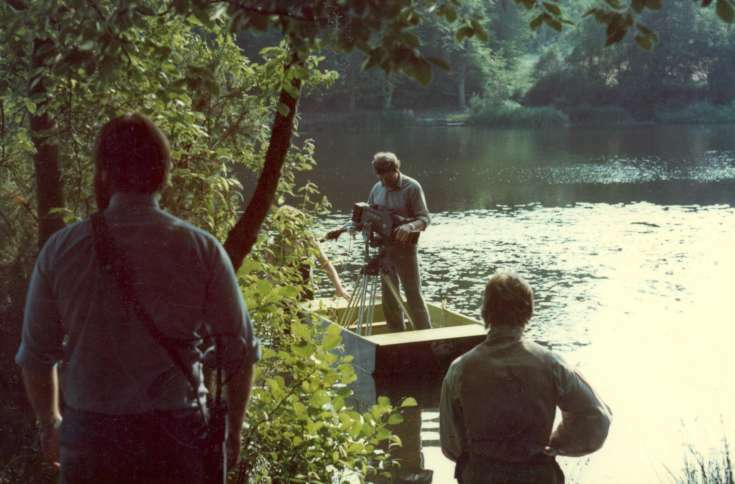 Pictured above is a cameraman taking to the water in, what seems to be, a boat hurriedly constructed by the props department! The Large Version shows a letter from the BBC confirming the arrangements. Select Open Document to view the six-page Outside Broadcast schedule. Further photographs of the day’s shooting can be seen on picture #1693.